The car is based on GM’s global compact car chasis. Its not the biggest car, but thats OK since most of my driving is as a lonely commuter. Unfortunately, no wife and no kids means its usually only me driving by myself to work. I don’t even drive my friends around much, since I’m so far away from them. The car itself isn’t a 5 seater, rather a 2+2 configuration, due to the large T-cell pack running up the center tunnel of the vehicle. The outside styling is great, in looks like a normal compact hatchback model car. It doesn’t stick out like most other green cars (Prius, Leaf). Its a little different in ways that respect the aerodynamic necessities of electric vehicles, but for the most part it still looks like a normal gasoline car, except for the charge port forward of the driver door (the girl at the car wash asked me if my gas tank was at the front of the car, I said thats where I plug it in, she was surprised). The interior is well appointed for a Chevrolet, which is good considering how much it costs. There are two LCD screens, one replacing the speedometer, tachometer and gauges area, and the other is the infotainment/navigation screen showing your music, outside temperature, and other facets of the car’s operation (showing where power is coming from or going to, efficiency meters, total power and gas used, etc). The center-mounted infotainment screen is touch-based, and you can tap around on the different screens. Your heating and cooling are controlled through the center screen, and not by any knobs or buttons on the center console. This can be a little annoying since you cant turn knobs by memory to crank up the heat or A/C – you have to look at the screen to tap. However, I usually operate the system by the “Auto” button on the console to turn on the climate control, and two other buttons to turn the fans up or down. The electric guts of the vehicle is a 16kWh (10.6kWh usable) liquid cooled lithium-ion battery. This feeds a 111kW (150HP) electric motor. When you’re out of juice, a 1.4L engine turns a generator that creates 55kW of energy at maximum. The energy goes from the generator to the electric motor to turn the wheels, and when there is extra energy, the rest goes into the battery. If there is a momentary energy defect, the electric motor can pull a little extra power from the battery. The car gets 35-40 miles in EV mode and 38MPG or so afterwards. Cold or hot weather decrease the range significantly (down to 25 miles in the worst cold cases, around 32F). The battery is warrantied for 8 years or 100,000 miles. Long enough to make a good return on the investment of the Volt. However the resale market is a little iffy due to no one really knowing how the batteries will last with time – Chevy only offers an “EV Miles” metric available to the user, and not some battery life expectancy forecast that would be useful to second-hand buyers. GM really went to town with the technology. As I mentioned above, there are two LCD screens in the vehicle, and one of those is a touchscreen. There is also an app for iPhone and Android smartphones. This app allows you to view battery charge state, fuel tank status, tire pressure, total EV milage and MPG, send commands to the vehicle to lock or unlock the doors, remote start, and for those with a nav system, send navigation destinations to the car. The On-Star system can also send you reminders to plug in the car if you forget. The MyVolt website offers a view into the statistics GM is collecting on your driving (if you opt-in to having an On-Star account). You can view efficiency information, daily mileage, as well as send commands like the smartphone apps. You can also program the Volt’s recharging cycle. You can specify to charge the car immediately on plug-in, or tell it when you’re leaving in the morning on which days of the week (it’ll figure out what time to start charging so its done when you’re set to leave), or setup a time-of-use schedule so it will charge when your electric rates are the cheapest (my utility offers time-of-use rates, and even a special cheaper night time rate for EV owners). On-Star is included for three years. After that, the included package is $300/yr. 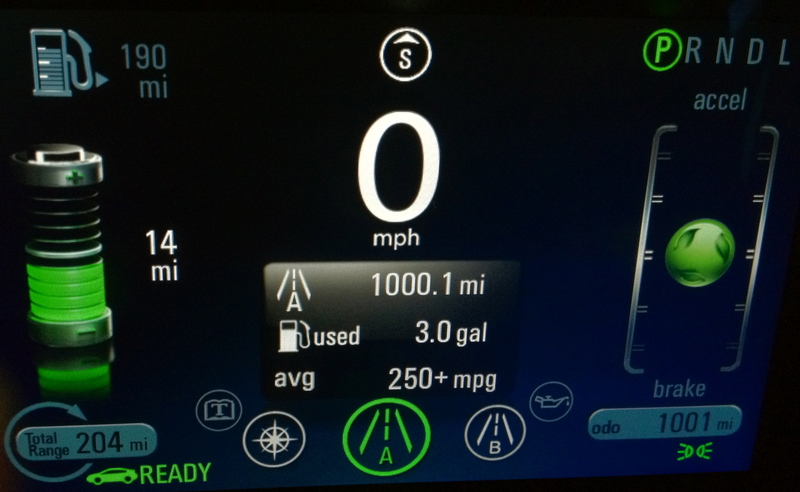 What makes the Chevy Volt unique is that, given its high price tag, you probably want to do the math to make sure this is the right car for you. If your average daily driving is between 25-50 miles and your daily driving is somewhat regular (doesn’t vary outside that range often, in math terms – the standard deviation is small), the Volt is a good choice financially. You’ll drive it enough to save a ton on gas, while not driving it too much where a Prius would be a more sensible car. The effective cost of the car, when the tax incentive and gas savings are factored in, is closer to $25,000, rather than the $40,000 sticker price. The $15,000 difference is from the $7500 tax credit, along with $7500 in gas savings over the first five years of ownership compared to a standard 25MPG vehicle (15,000 miles a year). For me this number is about right. I drive 12,000 miles a year, and my daily (four days a week) commute is 32 miles round-trip, plus weekend driving that usually stays in the EV range of the car. So what happens if you’re outside of this zone? My advice would be to wait. Battery technology will get better, but slowly. As battery technology gets better and cheaper, the range will start to expand. Don’t expect a huge electric-only driving range (40 miles is about right given current US driving habits, though if that changes in the future then the range may change), but expect smaller, lighter, cheaper batteries. And eventually bigger cars. Don’t expect anything big for another 4-5 years though, since the batteries to make a crossover-style Volt wont be ready for a while, mostly because of how long it takes for a prototype cell to go through qualification to be used in an electric vehicle (2-3 years of testing to make sure it can last and it will be safe to charge in your garage every night). So the total kWh each night was 10.1kWh, 11.2kWh, 10.3kWh, 8.8kWh and 8.8kWh, finishing charging before 2AM. The data above was taken from NV Energy’s website via my Smart Meter. I tried to factor out baseload of my house, as well as minimize the impact of fans and air conditioners. It’ll cost me an extra $25-35 per month for the Volt, most of the variability depends on how often I leave the house on the weekends to go hang out with friends (lately my weekends are spent at home and alone so it’ll be closer to the lower end of the range…). This will displace about $150 of gasoline from my budget each month based on my previous 23MPG car, for a savings of about $115-125 per month. If there was one thing George W. Bush taught me (the only thing, perhaps) is that oil is fungible. When you buy an oil-based product, it doesn’t matter where that specific gallon of oil product came from. Because there is a worldwide, robust trading network to transport oil around the world, the money you give the oil company essentially is paid to each company and country that produces oil in the amount they represent the world market. A gallon of oil not purchased by me in the US is a gallon of gas purchased somewhere else in the world for a slightly lower price. According to EIA, that $4 gallon of gas you bought, 72% of that cost was the cost of oil (or $2.86), and the economic impact of that $2.86 is spread out amongst every oil producing country in the world. So the US gets 12% ($0.34), Russia gets 12% ($0.34), the middle east gets 31% of that ($0.89), and Venezuela gets 3% ($0.08), and the rest to various other countries around the world. But if I buy electricity, not only do I get equivalent motive force for much cheaper, but that money stays in the US – to my friends and neighbors who work for the power company (and their CEO’s ever increasing total compensation), all that natural gas from fracking that pushed the price of natural gas to its lowest price ever, and coal from coal mines throughout the country (my utility’s energy mix is approximately 70% natural gas, 18% coal and 12% renewables, and natural gas only creates 1/4 the amount of CO2 per MWh as coal). As far as the power grid goes, NV Energy says they can accommodate 1,000,000 plug-in cars on their grid at night without needing any substantial transmission and distribution upgrades (read: rate increases). Don’t expect to be able to charge those vehicles during the day in the summer time though. Nationally, the US power grid can accommodate an electric vehicle penetration rate of about 40% using overnight charging, and 70% using a smart grid-optimized recharging scheme based on information from 2006 (the grid has added substantial transmission capacity, especially in the West, so those numbers might go up). We have a very long way before those numbers become a reality. The biggest unknown is the resale value of the car. This car has a few things working against – first generation technology, only 4 passenger seats, along with the state of the battery along with replacement battery costs. Replacement battery costs are closely tied with how successful (or not) electric cars become. If EVs are prominent in the future and lots of lithium-ion batteries are made, its likely that a replacement battery wouldn’t cost much in 2020 (around $3500). If EVs don’t take off, and the technology remains a niche application, batteries will be more expensive due to lack of mass production. The front air dam. Chevy offers a shorter air dam, but it comes with an aerodynamic penalty and I lose about 1 mile of EV range if I switch to it. I scape this longer air dam everywhere I go. As I mentioned above, the actual cost of the Volt is around $25,000 once you factor in gas savings and the federal tax credit. Recently, GM has been throwing money “on the hood of the car” (term used by dealers to describe cash rebate or financing incentives). When I purchased the car, the deals were $350/mo for a 36 mo. lease (not including taxes or registration) or 0% for 60 months to purchase. As of May 1, GM upped their incentives even more, to 0% for 72 months to purchase, and increased the lease capital cost reduction from $3000 to $4500, resulting in a lower payment – I’ve seen some dealerships offer sub-$300/mo lease offers, factoring in gas savings, that can lower your effective monthly payment to under $200. One thing to remember, is that if you don’t qualify for the full $7,500 tax credit when buying the Volt, you can still take advantage of it by leasing the car. The lease rate factors in the leasing agency will take the $7,500 credit for themselves. Also, leasing reduces the risk associated with buying first generation technology. The good news is that I believe GM is able to increase incentives because the Volt is getting cheaper to make as they manufacture more of them each month, as well as moving the battery cell production from Korea to the US – a GM executive stated that the cost savings of manufacturing batteries across the state of Michigan instead of the opposite side of the world was significant. Its my hope that the 2013 model year vehicle may have an after-rebate price below $30,000 (about the same as an after-rebate Prius Plug-in), compared to the current after-rebate price of around $32,500. I’m very happy with my Volt. Unless world peace breaks out and the geopolitical instability oil premium goes away and prices retreat to $60/bbl ($2.50/gal), its a wise financial choice for me. Almost five years ago now I stood in line for nine hours to buy the first iPhone for $600. I feel the same way about the Volt. The price wont come down nearly as fast but I’m confident that this is the wave of the future. (The rate of improvement on silicon chips is 40-50% per year, while the improvement in lithium-ion batteries is between 8-10%.) But I still look at it as the dawning of a new era. The electrification of transportation starts here, in the early 2010s. Once electrification takes off, we move to self-driving cars. Then self-driving flying cars. And then we’re the Jetsons. Also, see my article on the six things regular car owners need to know when they buy a Volt. Its a rolling fireball. The battery fire was 3 weeks after the Volt had been crash tested. I’d die of exposure or starvation if the fire department cant get me out of the wrecked Volt after three weeks. I’d also want to move to a different city with a more competent fire department. The testing facility did not follow proper post-crash procedure to drain the battery of energy. GM knows through the On-Star system to contact field staff when there is a severe Volt crash. The Volt is subsidized $250,000-500,000 per car ($3B/6000 units as of late 2011). Most of that subsidy money went to domestic lithium-ion battery manufacturers, an infrastructure shared amongst all domestically made electric cars that use lithium-ion batteries – the Chevy Volt and Spark EV, Ford’s C-MAX Energi Hybrid and Plug-in models, Ford Focus Electric, Chrysler’s various electric vehicles in various stages of development, and even the Nissan Leaf later this year. Also that money is spread out over 20 years in many cases (tax breaks on property taxes), so you’re taking 20 years worth of tax breaks vs less than one year of car production. Sloppy math. It can only go 40 miles. I get this one repeated to me a lot, and I think it has to do with people not understanding its a dual-fuel vehicle. I can go 40 miles on electricity and then forever on gasoline as long as I keep putting fuel in the tank. I don’t have to recharge the battery before I refill the tank. Once the battery is empty, it acts like a hybrid car. Obama is responsible for the Volt, and he is giving owners a hand-out. Development was initiated by Bob Lutz (who wanted a pure EV) and then with Jon Lauckner (who came up with the extended range idea) in 2006, and unveiled as a concept in January 2007. The $7,500 tax credit was in the 2008 Energy Act signed by George W. Bush. This is one of those things where, if successful, Republicans will try and take all the credit for the Volt’s success, no matter how much they bad-mouth it now. Voltec at-home 220V charger: $878 total – $550 for equipment (including tax and shipping), $225 for installation, $103 for city permitting and inspection fees.